Patient safety using RSI hinges on a redundancy of safety. Can you intubate? If intubation fails, can you ventilate? 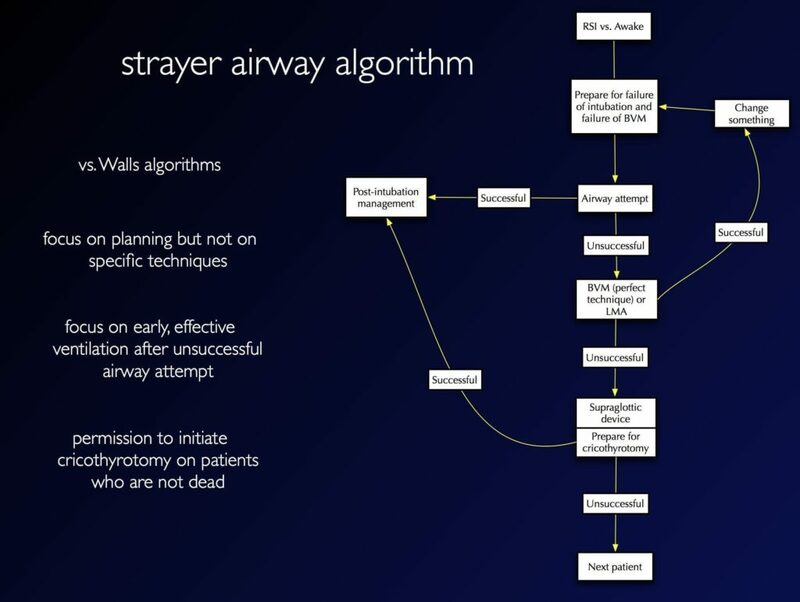 Algorithm (above) focuses on the route of intubation and RSI decision. The colored arrows are contraindications to RSI. In cardiac arrest (blue box – patient apneic) muscle relaxants are not needed. When there is obvious oral pathology, or intrinsic laryngo-tracheal pathology (green boxes – patient breathing spontaneously), the redundancy of safety does not exist – avoid RSI. When the mouth is blocked (step 2), intubate through the nose or through the neck (cricothyroidotomy). RSI is specifically done to optimize laryngoscopy conditions and permit oral intubation. If it is apparent that the oral route has obvious anatomic problems (not merely potential difficulty), RSI should never be considered. When the oral route is impossible, intubation will need to take place through the nose or neck, and this should be done with the patient awake. 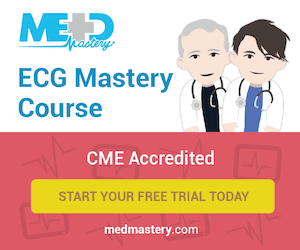 Examples include massive angioedema, advanced Lundwig’s angina, wired jaw, or readily apparent combinations of airway distortion, disproportion, and dysmobility (cervical spine and mandible), that preclude oral intubation. With intrinsic laryngeal pathology (step 3), safest approach is with the patient breathing spontaneously, using fiberoptic intubation, or a surgical airway (tracheotomy) below the level of the lesion. 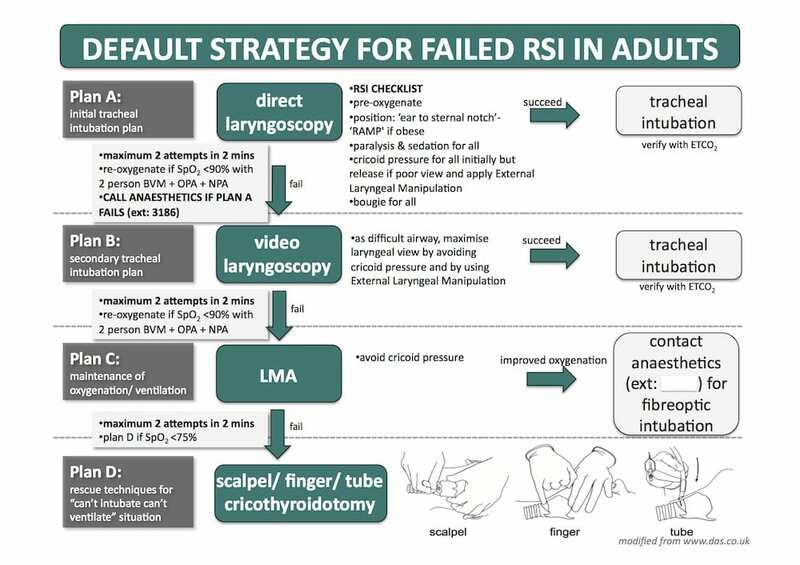 At step 4, the decision to use RSI is a matter of judgment, not a strict contraindication. The four Ds (distortion, disproportion, dysmobility, dentition) may make direct laryngoscopy with standard equipment impossible. Is an “awake” approach feasible? Will you be able to rescue ventilate? How fast are intubation and patient control needed? What are the risks of delay vs. the potential risks of RSI? 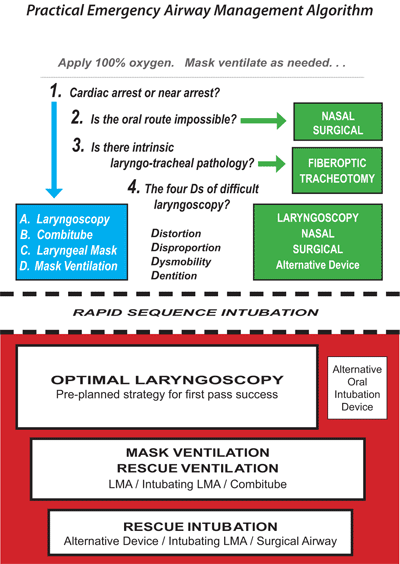 After crossing the RSI line, patient safety often depends on first pass success at laryngoscopy, since many patients requiring emergent intubation have very short safe apneic periods. Pre-oxygenation is only marginally effective in critically ill patients. 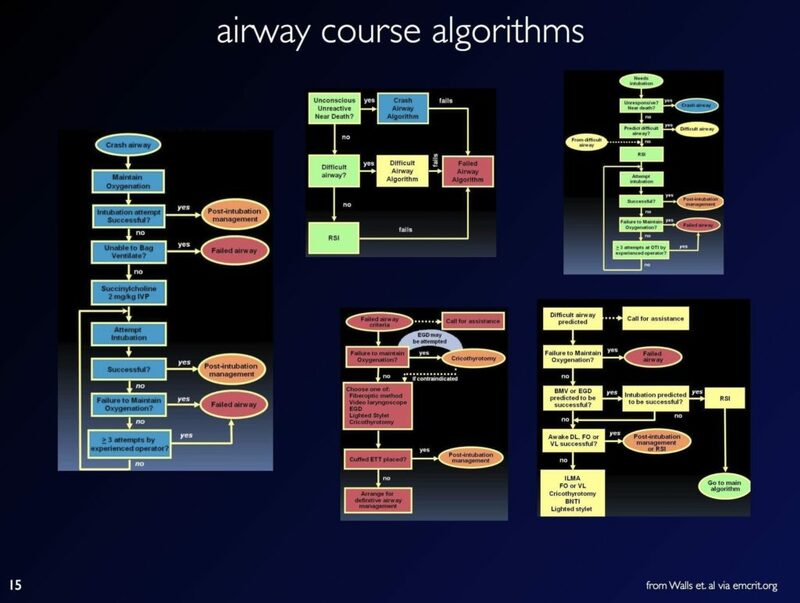 The Difficult Airway Society in the UK has comprehensive guidelines for airway management, including multiple algorithms. The integrated algorithm can be downloaded here (pdf). the Austin Hospital’s algoirthm by George Douros above, is a modified version of the DAS integrated algorithm – note that the option of waking the patient up has been removed for ‘out-of-theatre’ use! Henderson JJ, Popat MT, Latto IP, Pearce AC; Difficult Airway Society. 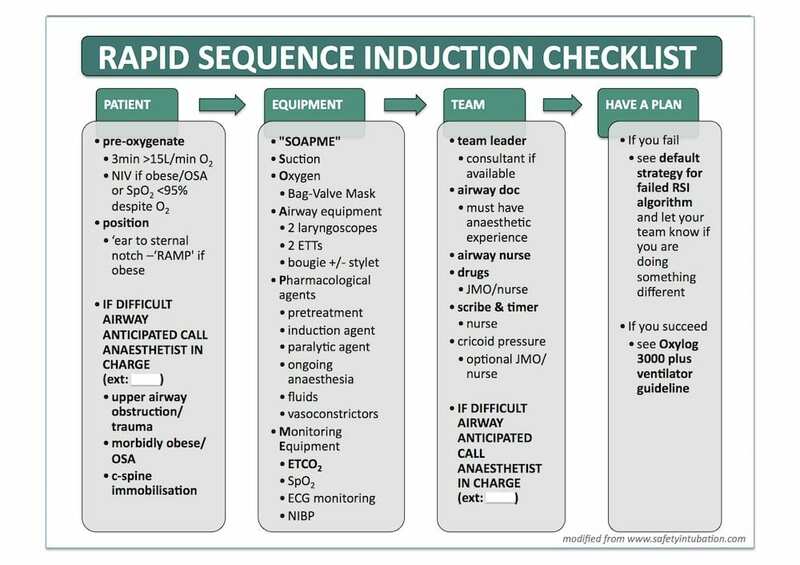 Difficult Airway Society guidelines for management of the unanticipated difficult intubation. Anaesthesia. 2004 Jul;59(7):675-94. 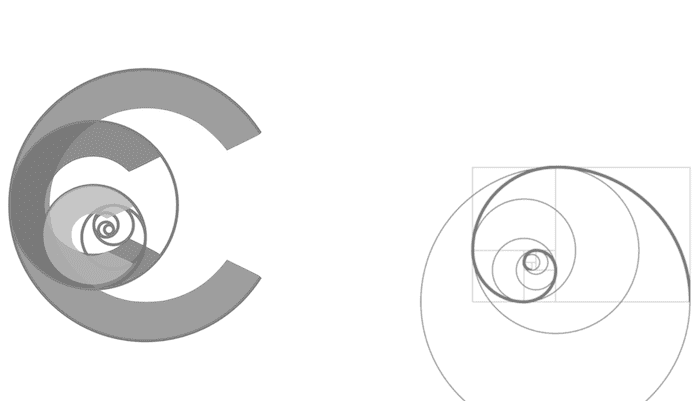 PMID: 15200543.